Find homes for sale or lease in Denton County TX and the northern DFW Metroplex. Browse thousands of listings in Denton, Dallas, Fort Worth and every city served by the North Texas real estate system. Find new homes in some of the fastest growing areas north of Dallas and Fort Worth including homes in new communities in Denton County and Collin County Texas. Find homes for sale in some of the best DFW suburbs, including McKinney, Frisco, Plano, Allen, Prosper, Highland Village, Flower Mound, Lewisville, Denton, Argyle, Grapevine, Colleyville, Southlake and more. Find homes north of Fort Worth and Dallas in family-friendly communities with exemplary schools, fabulous amenities and room to roam. The Northern DFW Metroplex has just about everything a family could ask for, in price ranges to suit all kinds of budgets. Whether you are looking for a simple 3-bedroom single-story ranch or a spacious luxury estate, you are sure to find a place you can call home in one of the hundreds of communities located in the DFW area. Need a good rental home while you put down some roots? No problem! What are the best suburbs in Denton County? What neighborhoods and subdivisions are the best for families? Where are the best school districts in Denton County or the DFW Metroplex? What’s going on in the Denton area real estate market? Who is the best Denton County TX real estate broker or Realtor? How do I save commission expenses when I’m selling my Denton County home? As a practicing real estate broker with over 18 years of experience selling residential property, Aaron can assist you with the process and provide you with help and answers to your questions. An experienced real estate professional can take the stress and hassle out of the home buying or home selling process and provide clarity when it is sorely needed. If you are selling a Denton County Texas home, Aaron offers one of the best listing packages in the business. 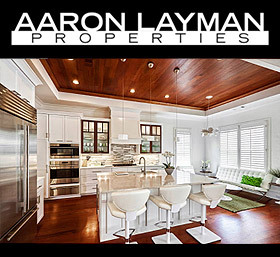 Aaron Layman Properties can provide you with better service than the big box real estate brokerages while saving you a ton of money. Aaron Layman Properties welcomes the opportunity to assist you with your next Denton County or DFW real estate transaction. The market insights section of this site features news and events relevant to the Denton Texas and DFW real estate market. Unlike many Realtors, I don’t sugar-coat the statistics. With degrees in both education and finance, I take pride in providing clients with timely, accurate information. Whether you are looking for the latest price trends, property tax rates, mortgage interest rates, or basic homeowners’ association information, Aaron Layman Properties is always working to provide you with the information you need to make intelligent real estate decisions. Contact us today to buy or sell your Denton County home!